Located in the historical center of Mexico City, the Santa Muerte Sanctuary is one of the most important landmarks for those who worship “The Bony Lady.” Three times a week, believers gather in the modest Bravo Street church to attend ceremonies deviated from Catholic mass. La Santa Muerte is probably the most popular idol in Mexico after Santa Maria de Guadalupe, an attention condemned by the Vatican, who sees the reverence for the skeleton saint as blasphemous. 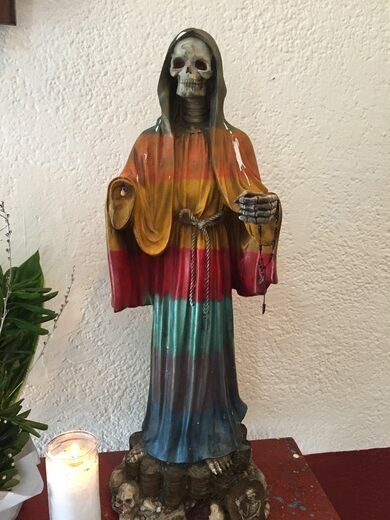 Suspiciously seen for sometimes being associated with drug trades and criminality, the Santa Muerte is the idol of the destitute, the one who lost hope and is outcast by the Catholic Church. The church itself contains a large statue of La Santa Muerte alongside the main altar. In 2007, David Romo, the Bishop of the Chapel, replaced it on the actual altar with a dressed mannequin, the Angel de La Santa Muerte, to avoid a too-macabre association with criminal acts. It's wise to take caution while visiting the area and be on the lookout for motorcycles whizzing by. There is a strange little carving of a person seemingly crushed by a pillar behind the remains of St. Thomas Aquinas. Hidden behind a wall for decades, this masonic lodge was only rediscovered during renovations.